1 A None No Power Seat 1 A is a Business Class Bulkhead seat that offers extra space. There is no floor storage during takeoff and landing. 1 C None No Power Seat 1 C is a Business Class Bulkhead seat that offers extra space. There is no floor storage during takeoff and landing. The proximity to the galley may be bothersome. 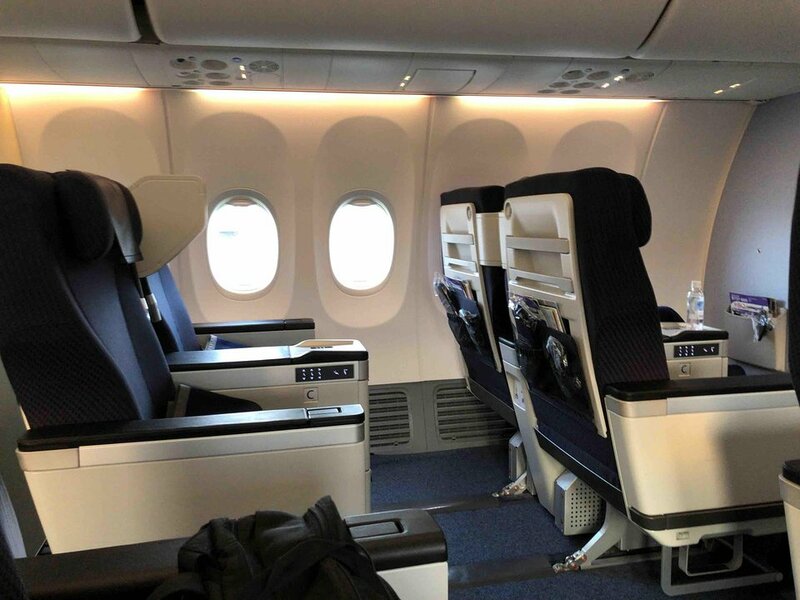 1 H None No Power Seat 1 H is a Business Class Bulkhead seat that offers extra space. There is no floor storage during takeoff and landing. The proximity to the galley may be bothersome. 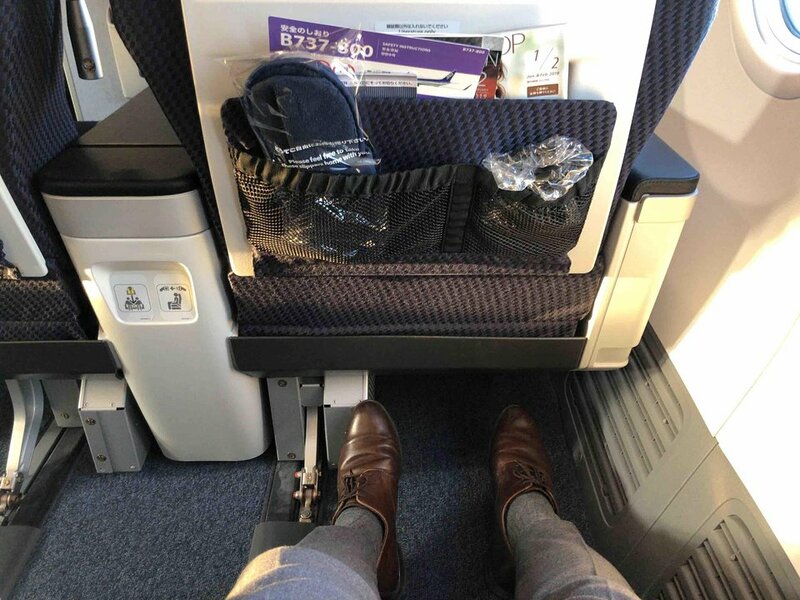 1 K None No Power Seat 1 K is a Business Class Bulkhead seat that offers extra space. There is no floor storage during takeoff and landing. The proximity to the galley may be bothersome. 13 A None No Power Seat 13 A is an Economy Class seat that has limited or no recline due to the exit row behind. 13 B None No Power Seat 13 B is an Economy Class seat that has limited or no recline due to the exit row behind. 13 C None No Power Seat 13 C is an Economy Class seat that has limited or no recline due to the exit row behind. 13 H None No Power Seat 13 H is an Economy Class seat that has limited or no recline due to the exit row behind. 13 J None No Power Seat 13 J is an Economy Class seat that has limited or no recline due to the exit row behind. 13 K None No Power Seat 13 K is an Economy Class seat that has limited or no recline due to the exit row behind. 14 A None No Power Seat 14 A is an Economy Class Exit Row seat that has extra legroom. However, this seat does not recline due to the exit row behind. The tray table is in the armrest, making the armrests immovable and slightly reducing seat width. There is no floor storage for this seat during takeoff and landing. 14 B None No Power Seat 14 B is an Economy Class Exit Row seat that has extra legroom. However, this seat does not recline due to the exit row behind. The tray table is in the armrest, making the armrests immovable and slightly reducing seat width. There is no floor storage for this seat during takeoff and landing. 14 C None No Power Seat 14 C is an Economy Class Exit Row seat that has extra legroom. However, this seat does not recline due to the exit row behind. The tray table is in the armrest, making the armrests immovable and slightly reducing seat width. There is no floor storage for this seat during takeoff and landing. 14 H None No Power Seat 14 H is an Economy Class Exit Row seat that has extra legroom. However, this seat does not recline due to the exit row behind. The tray table is in the armrest, making the armrests immovable and slightly reducing seat width. There is no floor storage for this seat during takeoff and landing. 14 J None No Power Seat 14 J is an Economy Class Exit Row seat that has extra legroom. However, this seat does not recline due to the exit row behind. The tray table is in the armrest, making the armrests immovable and slightly reducing seat width. There is no floor storage for this seat during takeoff and landing. 14 K None No Power Seat 14 K is an Economy Class Exit Row seat that has extra legroom. However, this seat does not recline due to the exit row behind. The tray table is in the armrest, making the armrests immovable and slightly reducing seat width. There is no floor storage for this seat during takeoff and landing. 15 A None No Power Seat 15 A is an Economy Class Exit Row seat that has extra legroom. Also, the seat in front does not recline, giving you more personal space. The tray table is in the armrest, making the armrests immovable and slightly reducing seat width. There is no floor storage for this seat during takeoff and landing. 15 B None No Power Seat 15 B is an Economy Class Exit Row seat that has extra legroom. Also, the seat in front does not recline, giving you more personal space. The tray table is in the armrest, making the armrests immovable and slightly reducing seat width. There is no floor storage for this seat during takeoff and landing. 15 C None No Power Seat 15 C is an Economy Class Exit Row seat that has extra legroom. Also, the seat in front does not recline, giving you more personal space. The tray table is in the armrest, making the armrests immovable and slightly reducing seat width. There is no floor storage for this seat during takeoff and landing. 15 H None No Power Seat 15 H is an Economy Class Exit Row seat that has extra legroom. Also, the seat in front does not recline, giving you more personal space. The tray table is in the armrest, making the armrests immovable and slightly reducing seat width. There is no floor storage for this seat during takeoff and landing. 15 J None No Power Seat 15 J is an Economy Class Exit Row seat that has extra legroom. Also, the seat in front does not recline, giving you more personal space. The tray table is in the armrest, making the armrests immovable and slightly reducing seat width. There is no floor storage for this seat during takeoff and landing. 15 K None No Power Seat 15 K is an Economy Class Exit Row seat that has extra legroom. Also, the seat in front does not recline, giving you more personal space. The tray table is in the armrest, making the armrests immovable and slightly reducing seat width. There is no floor storage for this seat during takeoff and landing. 31 H None No Power Seat 31 H is an Economy Class seat located in the last row of the plane and may have limited recline. The proximity to the lavatory and galley may be bothersome. You will also be among the last passengers to deplane upon arrival. There are only two seats in this row, making them a good choice for passengers traveling as a couple that would like more privacy. 31 K None No Power Seat 31 K is an Economy Class seat located in the last row of the plane and may have limited recline. The proximity to the lavatory and galley may be bothersome. You will also be among the last passengers to deplane upon arrival. There are only two seats in this row, making them a good choice for passengers traveling as a couple that would like more privacy. 5 A None No Power Seat 5 A is a standard Economy Class Bulkhead seat. The tray table is in the armrest, making the armrest immovable and slightly reducing seat width. There is no floor storage for this seat during takeoff and landing. 5 B None No Power Seat 5 B is a standard Economy Class Bulkhead seat. The tray table is in the armrest, making the armrest immovable and slightly reducing seat width. There is no floor storage for this seat during takeoff and landing. 5 C None No Power Seat 5 C is a standard Economy Class Bulkhead seat. 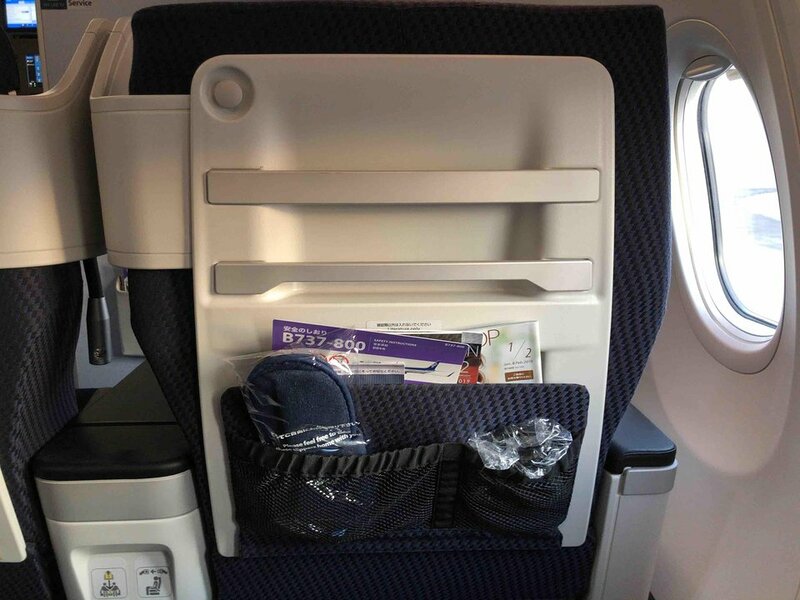 The tray table is in the armrest, making the armrest immovable and slightly reducing seat width. There is no floor storage for this seat during takeoff and landing. 5 H None No Power Seat 5 H is a standard Economy Class Bulkhead seat. The tray table is in the armrest, making the armrest immovable and slightly reducing seat width. There is no floor storage for this seat during takeoff and landing. 5 J None No Power Seat 5 J is a standard Economy Class Bulkhead seat. The tray table is in the armrest, making the armrest immovable and slightly reducing seat width. There is no floor storage for this seat during takeoff and landing. 5 K None No Power Seat 5 K is a standard Economy Class Bulkhead seat. The tray table is in the armrest, making the armrest immovable and slightly reducing seat width. There is no floor storage for this seat during takeoff and landing. ANA offers a variety of audio selections. Passengers can enjoy movies on the overhead video screens dispersed throughout the aircraft. All ANA passengers are also offered a wide selection of international and local newspapers. All Business Class seats feature 110V power ports. ANA operates this Boeing 737-800 on short- to medium-haul flights. There are two versions of this aircraft: This is Version 2 of the Boeing 737-800 and it flies in a configuration of 8 seats in Business and 158 seats in Economy Class. 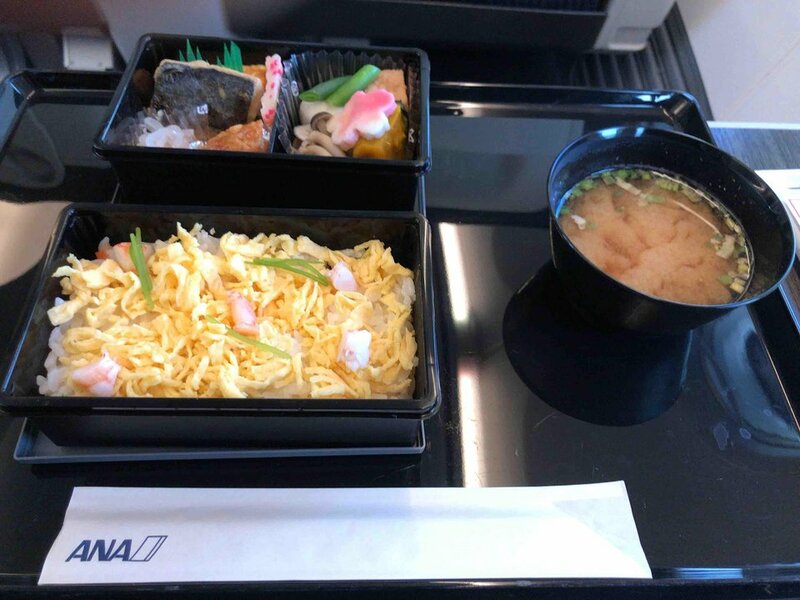 ANA flies 2 versions of Boeing 737-800 (738) .